“Actionable insights” is a popular phrase that we, as marketers, have heard a lot lately — but what does it mean? 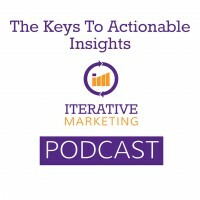 Actionable insights are vitally important to the Iterative Marketing methodology but also valuable to overall business success. Documenting and iterating are the keys to the process of discovering actionable insights. “Actionable insights” means that we simplify large amounts of data, put it in a format from which we can interpret information, and formulate a plan for continuous improvement. It is important to understand the relationship between data, information and insights. Data is raw and unprocessed facts — either qualitative or quantitative. Much data is not even consumable, besides being actionable. It could be thousands of website sessions or hundreds of thousands of ad impressions. It could be every tweet your customers have ever made or hours of focus group transcripts. When we process the data, and organize it in a consumable way, it becomes information that we present to our stakeholders in reports and dashboards. This information on its own is not insight. It needs to answer a question before it’s insightful. I could look at existing information – maybe someone has done this analysis before. Perhaps we have a customer-facing website with Google Analytics on it. All I have to do is go to the demographics report and I have the information I need to answer my question. If the information doesn’t exist, I can look to see if the data exists to answer my question – do we have survey data lying around? Is there a form that asks for a salutation? If the data doesn’t exist, how can I capture it? Can I run an analysis on first names? Can I administer a survey? Insights can answer a question, while actionable insights drive future action. Relevant: aligned to key business goals and plan for them. Useful outside of the environment in which it was derived. Supporting information that provides context to why this is important or unique. Delivered in a timely manner so they can be acted on while they are still relevant. Communicated with the right people, otherwise they cannot be applied. What do we do with these insights once we have generated them? Documenting and iterating for actionable insights often means segmentation or persona development. If an insight is gleaned from too broad of an audience, it is not universally applicable. Through documentation and iteration, we strive to round out the psychographic profile of our audience and test our assumptions on how they justify their decision. Document any other insights not tied to persona or segmentation that we have discovered. If they are not tied to a persona or a segment, it’s difficult to justify the validity of the insight to our goals as an organization. Documenting and iterating are keystones in discovering actionable insights, but they are in vain if not done continuously. Continuous documenting and iterating means setting up a loop or a cadence to insight-gathering on a monthly or quarterly meeting and meeting with your team to discuss the insights you want to obtain. Document the insight you want, and then develop the hypothesis you hope to prove or disprove to get there. Determine if you have the data or information to prove or disprove your hypothesis. Update persona and segment documentation. Share with other business stakeholders. Document any questions that come up in the process to readdress in the future. Actionable insights are the missing link between data and business outcomes. To be actionable, they must be relevant, useful, have context, substantiated, and delivered in a timely manner. Most importantly, actionable insights must be communicated throughout the organization. If we do all of this on a continuous loop then we are always getting smarter and always improving. I want to thank everyone for making a little time for us this week. Until next week, onward and upward.